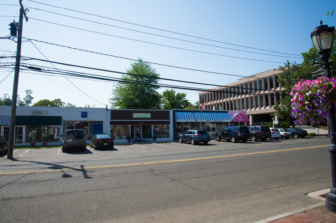 Some of the support for the massive downtown Darien redevelopment proposal between Corbin Drive, the Post Road and the highway is coming from businesspeople who worry that the downtown businesses district, for whatever reason, may be losing its competitive edge. Whether it’s retail shopping now going on over the Internet or business going to downtown shops in other towns, some business owners told the Planning & Zoning Commission that they’re worried. The P&Z held a public hearing Tuesday on the zoning changes wanted by Baywater Corbin LLC, a partnership of the owners of Baywater Properties and RG Properties. Although the hearing was specifically about particular zoning changes being proposed for the site, the P&Z after a while seemed to give up on the idea of holding speakers to the topic at hand and let them speak in more general terms about their support for the proposed redevelopment. 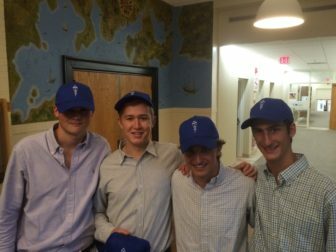 Baywater Corbin launched an effort to get supporters of its proposal to the P&Z hearing, with advertising and emails, and interns from Baywater Properties even handed out blue baseball caps with the logo from the Baywater website, YourDowntownDarien.com, for attendees to show their support. The owners of two stores that rent space from Baywater Properties and the director of the Chamber of Commerce said they strongly supported the proposal because they think it will boost the retail sales environment downtown. 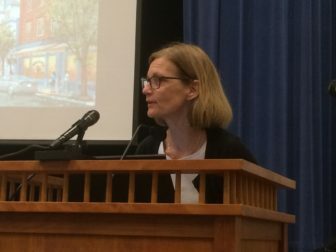 Susan Cator, director of the Darien Chamber of Commerce, speaks to the Planning & Zoning Commission. David Genovese, principal at Baywater Properties LLC, speaking at the public hearing. “I want to be up-front — there are a lot of vacancies in downtown Darien right now. Something is not working quite right. The Internet has had a profound impact on retail business and has taken a lot of business away from existing retailers. “Some of the new retailers and some of the old retailers are re-inventing themselves and learning how to use the Internet to capture sales, but what we fundamentally need to do is get critical mass with locally known boutique stores and strengthen their ability to present themselves to their customers. We believe that this project will do that. Interns were giving out these baseball caps in Blue Wave blue with the lantern logo of Baywater Corbin’s YourDowntownDarien.com in the front and the website address in the back. Genovese said that the project should generate enough revenue for the development company that it will be able to keep rent lower for the unique, locally owned stores of a kind now located on the site. 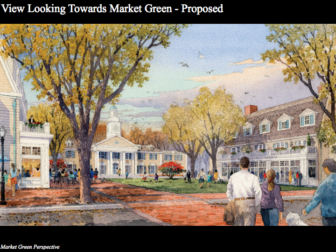 That would give downtown Darien a competitive advantage with other downtown shopping areas, like those in Greenwich, New Canaan, Westport, Norwalk and Stamford, where national retail chain stores dominate, he said. 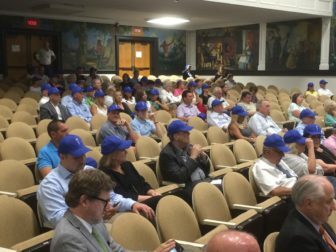 Plenty of people in the audience of about 90 were wearing the YourDowntownDarien.com caps at the P&Z public hearing on Tuesday. 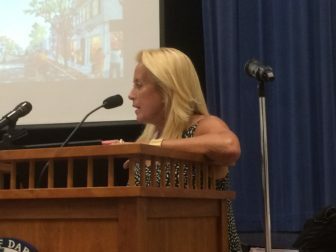 Erica Jensen, owner of the Helen Ainson store, spoke Tuesday to the P&Z Commission. The inclusion of a large underground parking garage on the site, will also help, she said. When Jensen worked in downtown Greenwich, she said, customers who gave up on trying to find downtown parking would call to ask whether the store had particular kinds of dresses rather than come in and see them. People are also now more cost-conscious when they’re shopping, she said. John Vaccaro, a Rings End Road resident with a career in real estate finance said the Baywater Corbin proposal broadly follows a concept that’s been successful in many places across the country, including San Francisco, Santa Monica, Ca. and in Florida. “The trend we’re seeing across the U.S. is this live/work/play concept that David and his group are trying to do in Darien. […] It’s not a new concept,” he said. “What people want to do is live and work closely together” without having to use their cars to go from place to place. 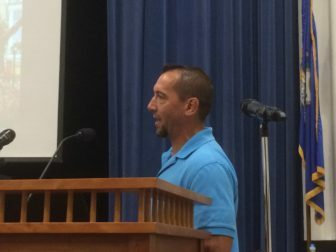 John Ruddy spoke at the public hearing. John Ruddy of 63 Old Kings Highway South said that when he and his family want to make a day of shopping and going to a restaurant, they head for downtown New Canaan. “There’s no real synergy in downtown Darien right now,” he said. Before the public hearing period closes, anyone is invited to tell the Planning & Zoning Commission what they think of the proposed zoning change either by attending the next scheduled hearing date, Tuesday, July 12, at the Town Hall Auditorium, or by emailing Planning & Zoning Director Jeremy Ginsberg at jginsberg@darienct.gov. 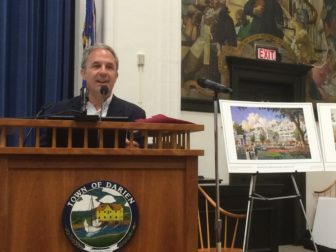 You can find out more about Baywater Corbin LLC’s proposal at its website: YourDowntownDarien.com. Planning & Zoning Comm 6-21-16 from Darien TV79 on Vimeo.